Hiya! I'm hoping to bring this to the attention of Marcus. I bought this vase a few years ago, knowing absolutely nothing about it. I found it, trawling through "Art Glass" on ebay, it had a "buy it now" on it, which struck me as being incredibly reasonable for what looked to me to be a very competent piece of glass, and I bought it on a whim. I've never regretted it, it is beautiful. I've done a little research, and found out there was a Czech artist, Laisner who is quite a celebrated artist, and academic professor (but mostly for architecture and paintings), who ended up working in the states, which is where I bought it from. The vase is clearly signed on the base, Laisner, with a "smiley" accent above the s, then a slash and 75. I tried to photograph it, but can't get the camera to focus. Apologies for the poor quality of the pictures. The vase is 9 inches tall. Do you know anything about Laisner, Marcus? Is this a vase of as serious interest as I think it might be? I don't really care if it isn't. I love it. My brother refers to it as my "Miro" vase, because it reminds him of a Miro painting. Googling the name brings up one more reference than it used to, which does state that he was running hot glass workshops in the states. This is a little progress! 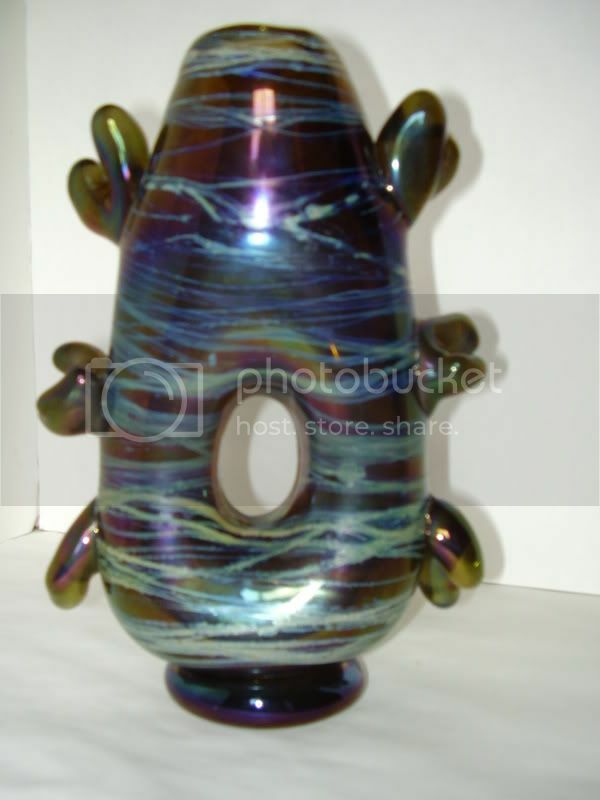 I'm wondering (because of the Czech origin) if he was proficient in any form of hot glass work himself, or if he designed this and had a competent glassmaker make it. And if he made glass, how much? Following informal discussions, I've kind of concluded that Laisner, having gone to the states as a 5-year old, is more likely to be considered an american artist than Czech. However, he did run a hot glass studio, so I think there is a strong possibility that he had a hand in making this vase himself, rather than being simply the designer. I've edited the title to include forenames of the artist. What a good idea, Christine - done! Thank you, moderator (Frank?) for changing the title. I have heard from Steve Adams, who has provided me with a good bit more info, and is happy for me to pass it on here. worked with him in the early 70's and he helped me to get started. didn't produce very many pieces that made it to the outside world. Most went to family, friends and locals. I am unsure how to add the scans of the leaflet - I've downloaded them to my pc. From the info there, I found out he went to america when he was about 7, not 5. This is the homepage of Steve Adams' own website. Well worth a look! I was wondering if this thread could be moved to the "Resolved Queries" section, USA please? And could anybody tell me how to get the scans of the information leaflet to show here? Would using photobucket work? Should do Sue, or if you want them on the board permanently one of us Mods could add them for you if it helps? Email them over if you want us to do this. I never shift or delete things in or from photobucket - I've put too many pics in too many important places to allow them to disappear! But for the sake of being able to read what's on these scans, I'll attempt to email them to you - thanks ever so much Anne! (It was the shifting of a few bits of American Studio Glass over there which prompted me to dig up this up.) I do think it's an important piece of glass - and absolutely gorgeous. Mod: Sue's scans added for reference.